With Z-OptimiZr Real-Time for SharePoint, all MS Office files like DOCX, PPTX and XLSX files and JPG files uploaded to your SharePoint servers are automatically optimized (i.e. made on average 50% smaller) before to be stored into your SharePoint server databases. Native XML File Optimization for all MS Office XML files like DOCX, PPTX and XLSX files. Native Image File Optimization for JPG files. Running on your SharePoint Servers, Z-OptimiZr Real-Time for SharePoint optimizes the files being uploaded by the users transparently and automatically. 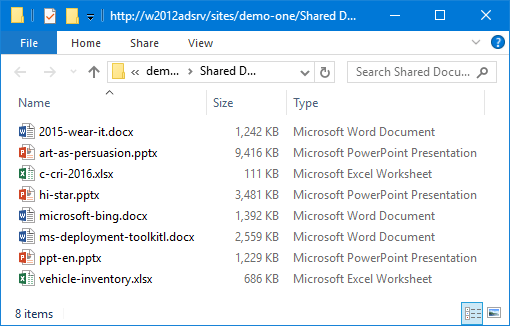 SharePoint users have nothing special to do; they upload their files to SharePoint as usual (using their web browser, Windows Explorer, OneDrive, WebDav folders...). Files consume most of the SharePoint disk space. 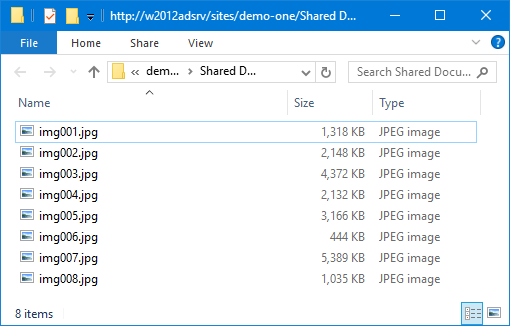 Reducing by 50% on average the size of all MS Office files and JPG files uploaded to your SharePoint servers drastically reduces SharePoint disk space consumption. Reducing by 50% on average the size of all MS Office files and JPG files being stored in your SharePoint databases as a huge impact on their growth rate. Uploaded files made smaller by Z-OptimiZr Real-Time are inserted faster in the SharePoint server databases. The files to be served being smaller, they are extracted faster from the SharePoint server databases and downloaded faster by the users. For a given file made 2 times smaller by Z-OptimiZr Real Time, SharePoint server will consume 2 times less resources (Disk space, CPU, disk IO, network, processing time…) and this during the complete life cycle of this file. 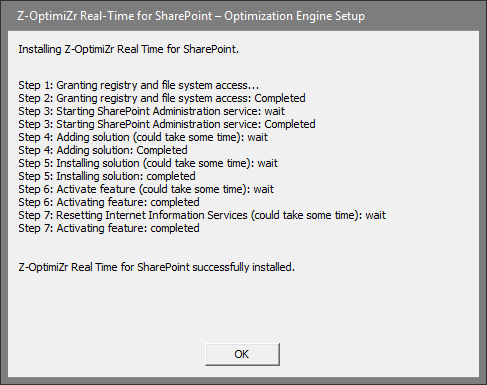 What is Z-OptimiZr Real-Time for SharePoint? The Z-OptimiZr Real-Time optimization engine is provided under the form of a SharePoint Feature in a standard WPS setup package coming with its automatic setup program. 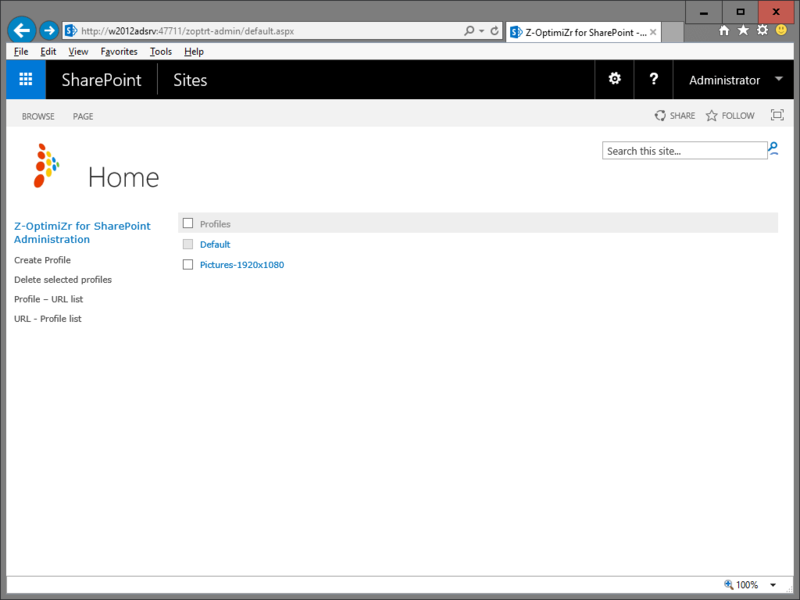 Z-OptimiZr Real-Time for SharePoint comes with an administration application provided under the form of a fully integrated SharePoint web site. 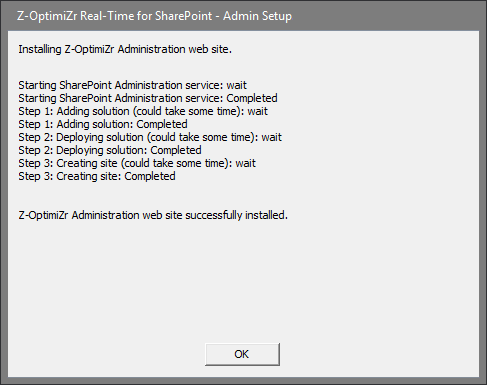 How does Z-OptimiZr Real-Time for SharePoint work? 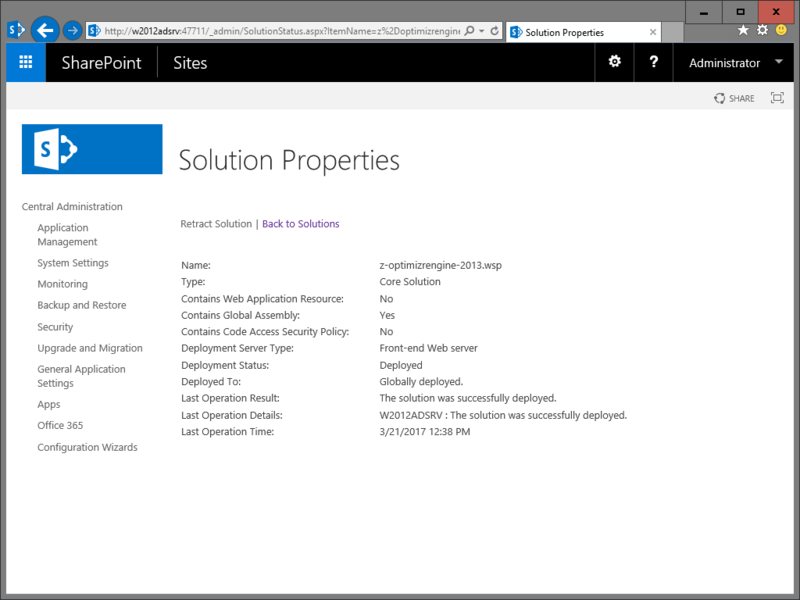 The Z-OptimiZr Real-Time Optimization Engine SharePoint Feature is deployed globally via its WPS package (The Deployment Server Type is "Front-End Web Server"). 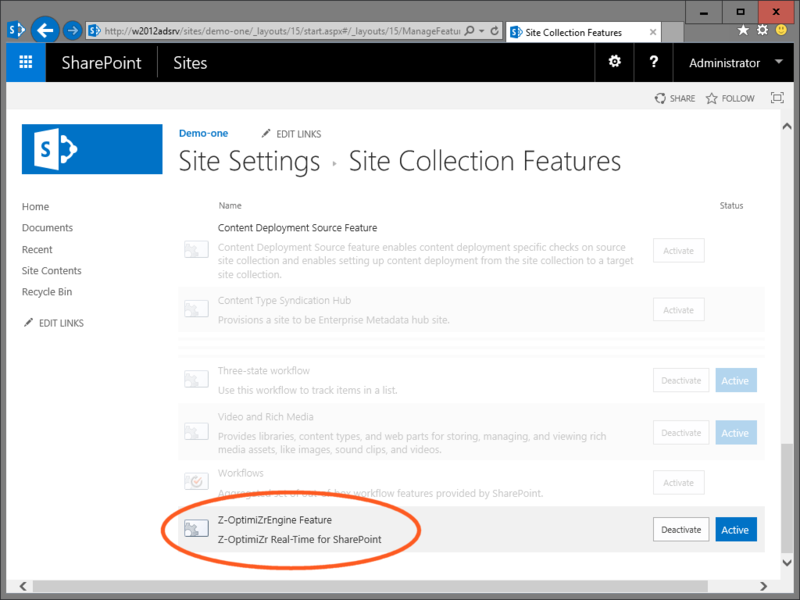 The atomic scope of activation of the Z-OptimiZr Real-Time SharePoint Feature is the Site Collection. 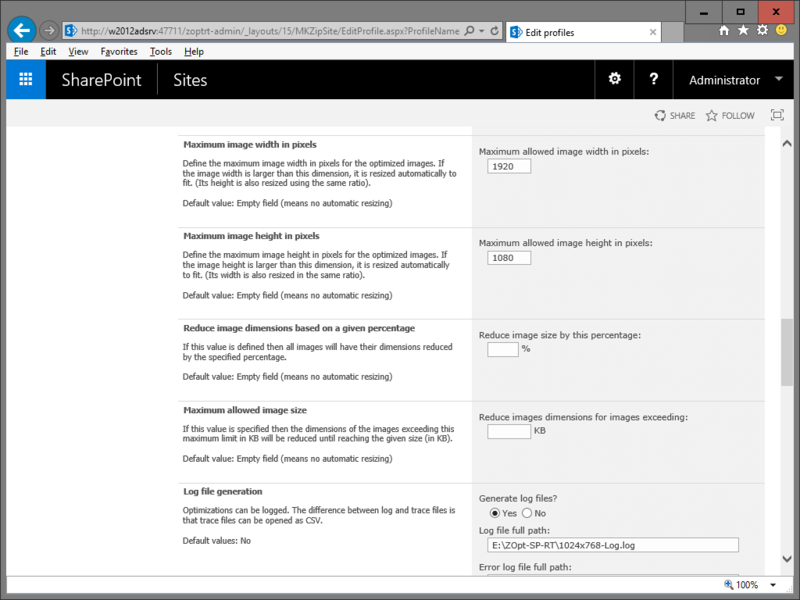 Activating the Z-OptimiZr Real-Time SharePoint Feature for a given Site Collection means that the files uploaded to this Site Collection can benefit of the Z-OptimiZr Real Time optimization features. Utilities are provided to facilitate the activation of the Z-OptimiZr Feature on large numbers of Site Collections. 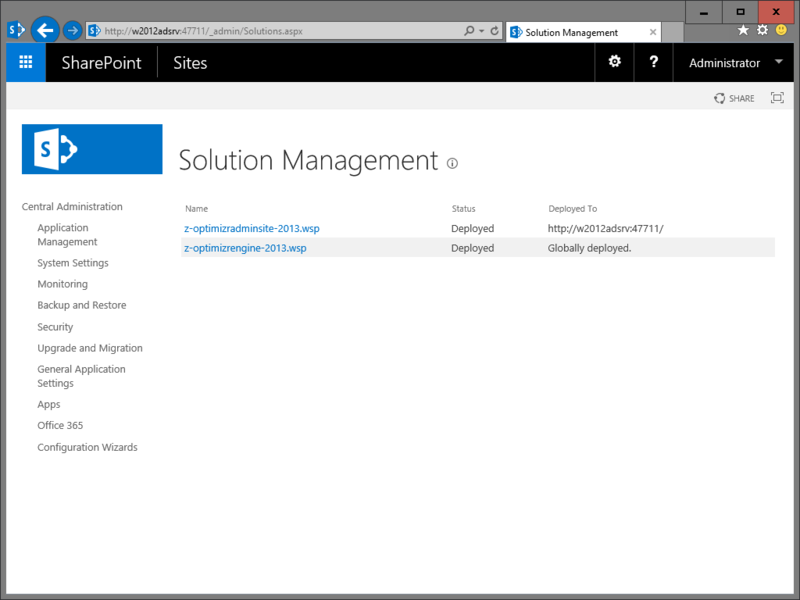 Once deployed, the Z-OptimiZr Real-Time Optimization engine WSP package (as well as the Z-OptimiZr Real-Time Admin site WSP package) are both listed in the SharePoint Central Admin Solution Management Panel. The Z-OptimiZr Admin web site enables to define different parameter sets (profiles) that can be applied to given SharePoint Site Collections, sites or libraries; for instance, for some given image file libraries the JPG files can be optimized and resized to 1920 x 1080 pixels, while for some other libraries they are optimized without being resized. Although the Z-OptimiZr Real-Time optimization engine, being provided under the form of a SharePoint feature, is activated / deactivated on a per site collection basis, the Z-OptimiZr Admin web site enables to activate / deactivate the the Z-OptimiZr Real-Time optimization features (Native XML file optimization, Native image file optimization) individually, and if needed, only for some sites or libraries and only for given file types. What kind of volume reduction results is Z-OptimiZr Real-Time for SharePoint able to deliver? With file optimization and compression, the volume reduction results always depend on the content of the files. Thus the above results have to be taken as examples of what Z-OptimiZr Real-Time for SharePoint, and our other optimization software as well, are able to achieve in terms of native MS Office and picture file optimization. It is very easy for you to evaluate Z-OptimiZr Real-Time for SharePoint with your own files. All you have to do is to download an evaluation copy, install it (in a few minutes, following the step-by-step instructions of the installation guide) and start using it. You can also download an evaluation copy of Z-OptimiZr for SharePoint Databases, our other optimization software for SharePoint servers. The purpose of Z-OptimiZr for SharePoint Databases is to optimize the files already stored in SharePoint libraries. 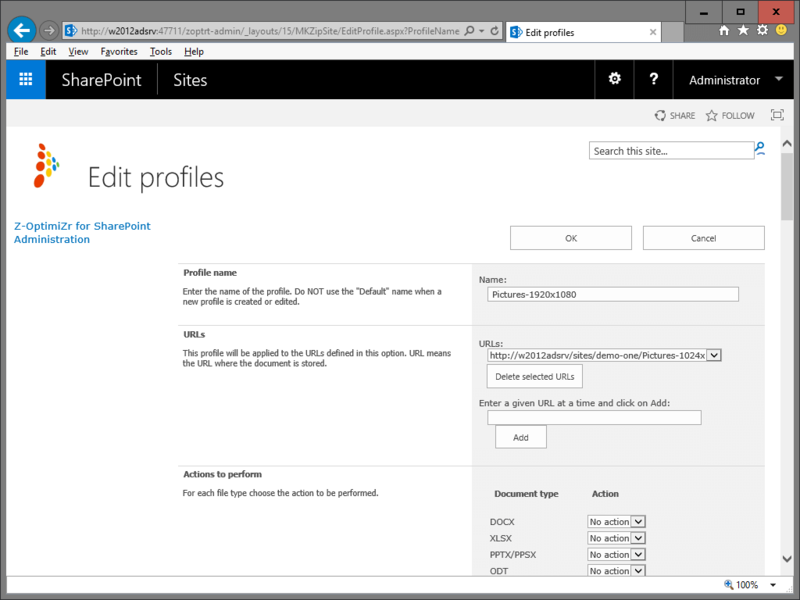 You can run it in test mode (in test mode, it will not modify your existing files) against any SharePoint document or image libraries of your choice. It will tell you the exact amount of disk space it is able to retrieve on the selected libraries and will generate the corresponding csv log files containing all the details for each optimized file.